Every spinner has a stash of fibers that are just waiting for an inspiration. You can create your collection by purchasing a wide variety of fibers, and each one offers a different spinning experience. You can use the following information to help you purchase and care for the different fibers that you will use. You may also want to start a fiber log to keep track of what fibers you have, where you got them, and how you liked working with them. Raw fiber: Raw fiber has not been processed for spinning; it is just as it came from the animal or the plant. You can purchase raw fiber that is washed, scoured (scoured means that all of the oils have been removed), or dyed. If you want to dye fiber, whether animal or plant, it needs to be scoured first. Carded fiber: Carding is a process that opens the fibers up, untangles them, and distributes them more evenly. When fiber is carded, it’s in big airy rolls called batts. When fiber is carded at a mill, it comes in a continuous length, and is called roving. 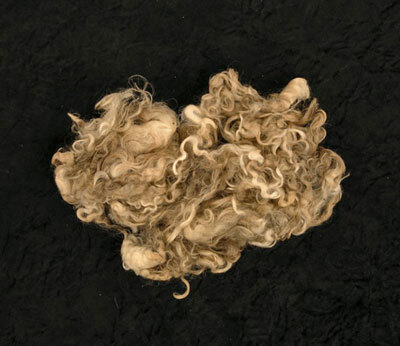 Carded fiber can be made from a variety of different fleeces and fibers, and it comes in natural or dyed colors. It is the easiest type of fiber preparation to spin and is a good choice for a beginner. Combed fiber: Combing separates the fibers by length and strength, and any fiber that is weak, damaged, or short is removed. Combing also removes all of the chaff and vegetable matter. This process straightens all of the remaining fibers and leaves them lying side by side. Combed fibers are called top. 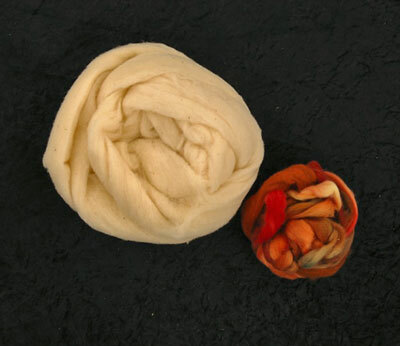 Top is more expensive than roving and is a bit more difficult to spin, but it produces strong, lustrous yarn. To tell whether fiber is top or roving, pull the fiber apart. Top pulls apart in a straight line; roving leaves a rough, triangular-shaped edge. All fiber needs to be protected from moths, mice, and moisture damage. The most foolproof way to do this is to use plastic containers (preferably see-through ones) with snug-fitting lids. Avoid storing your fibers in baskets, brown cardboard boxes, or bags. These storage methods can house moths, which can eat an alarming amount of fiber. If you want to display your fiber attractively in a basket, then line it with heavy plastic bags first. You should use a neutral-pH detergent to wash fibers. Fill a container with hot water, add the detergent, and stir. Add the fiber, gently pushing it under the water. Let it sit without agitation until the water cools, then drain the dirty water, and rinse the fiber in fresh, cool water. If the fiber is really dirty, you may have to wash it more than once. You can get the excess water out by either using the spin cycle on a top-loading washing machine, or by pressing it out with a towel. If you are washing a small amount of fiber at a time, you can use a salad spinner to spin out the water. You can use a top-loading washing machine to wash some types of fibers, if you do it carefully. Lingerie bags are helpful for keeping the fiber intact. Crockpots are great for washing small amounts of fiber, especially mohair locks, which need a high heat to clean properly. Be sure that you rinse all of the soap out of protein fibers, as it can cause them to disintegrate. An extra rinse with a little vinegar is a good idea, especially for silk. If your water has a high iron content, wash your fibers by hand or in a crockpot so that you can use filtered or bottled water. The iron not only stains fibers, but it also weakens them. Wool can be hard to clean, particularly if it is fine. Wool has many natural oils and waxes; the two main oils are lanolin (which waterproofs the sheep) and suint (which is a natural soap that keeps the sheep clean). You need to remove these oils and waxes to process and dye the wool. Soak the wool for a day or two in water. This dissolves the suint, and removes most of the dirt. Rinse out the dirty water, and fill a container with hot water and detergent. Add the wool, let it sit until it cools, and then rinse in warm water to remove the waxes and the lanolin. Occasionally, you may not remove all of the oils and waxes from wool. When this happens, the wool develops a gummy texture. Re-wash with very hot water and detergent. To test whether all of the oil is removed, take a bit of dry washed fleece and iron it on newspaper with a hot iron. If it leaves a greasy mark, then it needs re-washing.